With the Akiles DuoMac C41 you can bind documents with both Plastic Combs and 4:1 Pitch Spiral Coil. The DuoMac C41 is the only combination machine of its kind. The unique design of the C41 includes a wire closer (for use with Spiral-O 19 loop wire), a plastic comb opener and the ability to punch both a 19 hole pattern for plastic comb binding and a 4:1 pitch hole pattern for Spiral Coil Binding. Normally, you would have to use two or three different binding machines to do the same tasks as the DuoMac C41. This meas that the DuoMac C41 can save you space, time and money. This purchase was to replace a GBC electric coil punch machine. We have a very old GBC manual punch that is still working 10+ years later and the electric coil punch would break down annually - we got tired of having to get it fixed and decided to purchase an all manual machine. SO VERY GLAD WE DID THAT. The machine replaces both the manual punch and the electric punch in one easy to use machine. I will say, make sure you have a LARGE empty space for the manchine, it's pretty big. Welcome to MyBinding video. 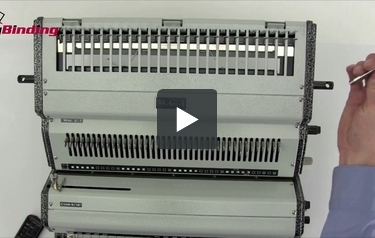 Let's take a look at the DuoMac C41, a 4:1 coil and plastic comb binding system by Akiles. Let's watch the C41 in action as it binds a book with spiral coil. The first thing to do is set the side margin control knob so that all of your punches will be consistent throughout your entire project. If you get any half holes or punches that are too close to the edge, you may want to remove one of the disengageable die pins so that won't happen. Also, according to the size of your project, you may want to adjust the depth of margin control as well. That way larger books can have a larger margin, it's stronger. With all your settings in place, let's begin with the covers. Make clean, strong, consistent punches. The C41 can handle up to 20 sheets of 20lb paper per punch. Once you've punched through all your pages, gather your project together; it's time to bind. There's several ways to finish off a coil project by inserting. You can check out our different videos on inserters and crimping by hand. That's it, that's easy coil binding on the DuoMac C41. For other demos, reviews, and how tos, check out MyBinding.com. Welcome to MyBinding's How To videos. This is easy assembly of the DuoMac C41. You've managed to get it out of the box, now you need to put it all together. Let's begin at the top and fasten the comb opener. You have two black rainbow-shaped brackets. Take the one with the "L" and place it on the left-hand side with the "L" facing in and screw it in with the Allen wrench. Do the same thing on the right side with the right bracket. Now take the entire assembly and set it atop the black brackets with the fence on the back side and again with the Allen wrench, fasten the bolts. The black handle with the metal shaft goes in either side, right or left, for right- or left-handed. Screw it right in; that's your lever to open and close the comb opener. Of the three levers provided, take one of the smaller ones and place it on the back post of the main unit. Twist it in with your hand and then with a quarter or a screwdriver, all the way in. Then, take the longest handle and place it on the more forward one. On the left-hand side, take the third and short handle and place it there. The two levers on the right are for punching holes, the one on the left is the wire closer. That's how to assemble your C41. Happy binding! For more demos, reviews, and how tos on this product and many more, check out MyBinding.com. Transcript: Welcome to MyBinding video. 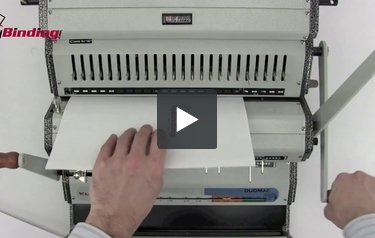 Let’s take a look at the DuoMac C41, a plastic comb and 4:1 coil binding system by Akiles. Let’s watch it in action while binding a book with a plastic comb. First off, set your side margin control knob so that all punches are consistent throughout your entire project. Punch down with the punching arm and have a look. Should you have any half punches or irregular size sheets of paper, you may need to pull out some of the disengageable die pins. Finally, you may want to adjust the thickness of the margin according to the thickness of the book you’ll be making. Welcome to MyBinding video. 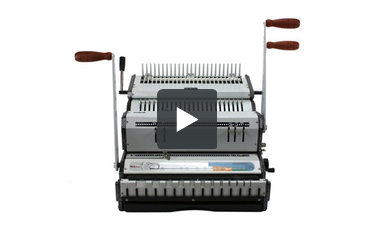 Let’s take a look at the DuoMac C41, a plastic comb and 4:1 coil binding system by Akiles. Let’s watch it in action while binding a book with a plastic comb. First off, set your side margin control knob so that all punches are consistent throughout your entire project. Punch down with the punching arm and have a look. Should you have any half punches or irregular size sheets of paper, you may need to pull out some of the disengageable die pins. Finally, you may want to adjust the thickness of the margin according to the thickness of the book you’ll be making. With all your settings made, it’s time to begin. Start with the covers, punch them all the way through, and work through the rest of the pages in your project, punching in batches of 20 sheets of 20lb paper or less per lift. When your punches are made, gather your sheets together; it’s time to bind. Put the plastic comb over the opener in the back. Make sure the teeth of the comb face up and the project faces down; that way it doesn’t come apart in use. Use the lever arm to open the teeth of the comb, slide your project in, thread it through all the teeth, and close the comb. And you’re all done. That’s it, easy comb binding on the DuoMac C41. We also have a video on the same machine doing coil binding. For other demos, reviews, and how tos, check out MyBinding.com. The Akiles DuoMac C41 is the only binding machine available on the market that is capable of binding documents with both plastic combs and 4:1 pitch spiral coil. This makes it ideal for organizations that need to do more than one type of binding or who want one look for their internal communication and another look for their customer presentations and proposals. The DuoMac-C41 includes all of the features of two complete binding machines in one convenient package can even be shared between two departments with different presentation needs. This is the only desktop binding machine that can bind documents with both Plastic Combs and 4:1 pitch spiral coil. It includes two different punching slots. One produces the rectangular holes used for 19 ring plastic comb binding. The other produces a pattern with four round holes per inch. It also includes a plastic comb opener for finishing documents with plastic combs and a wire closer for use with Spiral-O wire combs. This machine can bind documents with four different binding styles: GBC Style Plastic Binding Combs, Spiral-O Wire 19 Loop Wire-Combs, 4:1 Pitch Spiral Coil and GBC Zipbind. The DuoMac C41 offers the ability to bind both small and large sized documents. Each punching throat has its own depth of punch margin control allowing you to control the distance of the holes from the edge of the document. This will allow you to bind documents with spines as small as 3/16″ and as large as 2″ in diameter. The DuoMac C41 offers fully disengageable dies and a legal width punching throat for plastic comb binding. This allows users to bind any length of document up to fourteen inches with plastic combs. The 4:1 pitch coil punching throat is thirteen inches in length and has five strategically placed disengageable pins that allow it to be used with the most common sizes of documents. Both punches are open ended and can be used for punching longer documents. This is an extremely durable binding machine that is made from heavy duty metal components. The DuoMac C41 system is built with the same quality as the other machines in the Akiles line of binding equipment and comes with a one year warranty for both parts and labor. Although Akiles was able to include a huge variety of features on this machine, there was only room for so many things. The one major component that this machine is missing is a spiral coil inserter for use with the 4:1 pitch punch. Akiles recommends purchasing a Roll-@-Coil inserter along with this machine in order to increase productivity in binding documents with coil. With so many features and components on one machine, the DuoMac begins to look a little bit like an octopus. This machine has four handles, one wheel and a number of different knobs. It is a fairly large machine and can be a little bit confusing to operate, especially for inexperienced users. Although the Duomac C41 is a heavy duty binding machine, it is no match for a modular electric binding punch. This machine is designed for organizations that need to bind a maximum of fifty to a hundred documents per week. Organizations that need to bind more documents than this should really consider a machine with an electric punch. The Akiles DuoMac C41 is an ideal choice for organizations that are looking to bind documents with both plastic combs and 4:1 pitch spiral coil. The construction of this machine is excellent and it offers a level of flexibility and versatility that is simply not available from other binding systems. In order to get the most out of the DuoMac-C41, it should really be combined with a spiral coil inserter such as the Akiles Roll @ Coil. However, even when combined with a coil inserter, high volume users should consider a modular binding punch instead of this system.